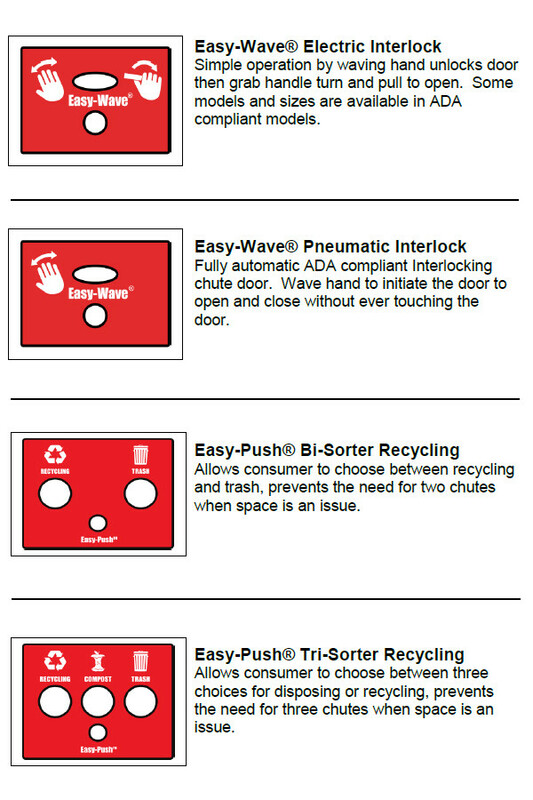 The Easy-Wave® trash chute system is designed to lock out all other intake doors on the trash chute when a door is in use. This is to ensure the safety of users that interact with the chute. The Easy-Wave® Easy-Push® system's signature feature allows touchless, one-handed operation that unlocks the chute door when a motion sensor is activated. In electric interlock systems, the user then manually opens the door and disposes of their trash, while in pneumatic interlock systems the door automatically opens, allowing the user to deposit their trash with ease. Each Easy-Wave® door is equipped with a motion sensor and an LED window. In systems with a trash sorter, a set of push-buttons allow the user to select a trash sorting option. The system is equipped with a Master Controller that facilitates overall management of the Easy-Wave® system and any connected devices. The Master Controller contains a monitoring system that streamlines chute maintenance by identifying where service is needed. It can configure the trash chute's responses to open doors, falling trash, and alarm states. It also facilitates the mapping of chute doors to building floor levels and the use of a connected chute wash-down system. The Master Controller is equipped with a Lock Out toggle switch and a user interface with a 32 character LCD, an LED window, and two push-buttons. The Easy-Wave® system is UL® listed and approved. This system consists of a Wash Down controller located at the top of the Chute. This controller incorporates the Easy-Wave® termination, so it must be the LAST device on the Easy-Wave® door chain. Also included are two solenoid valves, the soap injector, the soap solution reservoir equipped with a soap level sensor and the wash down spray head. All that needs to be done is for the plumber to hook up the water supply via a shut-off valve and vacuum break. - Each Cycle can be configured from 0 to 30 minute durations. Setting the duration to 0 skips the cycle. - Warning is given if soap solution is LOW - but the wash cycle will proceed. - Chute automatically goes back into service as soon as the Wash Down completes. -- Toggle Lock Switch to LOCKED to lock out the chute. -- Press MENU Button to select "WASH DOWN System"
-- Press SELECT button to select "Start Wash Down"
-- Toggle Lock Switch to OFF to initiate the Wash Down. - Ability to cancel the Wash Down from the base station if desired. The Master Controller supports the BACnet interface to the Building Automation System (BAS). The following BACnet registers are supported by the Master Controller via the BACnet interface device. 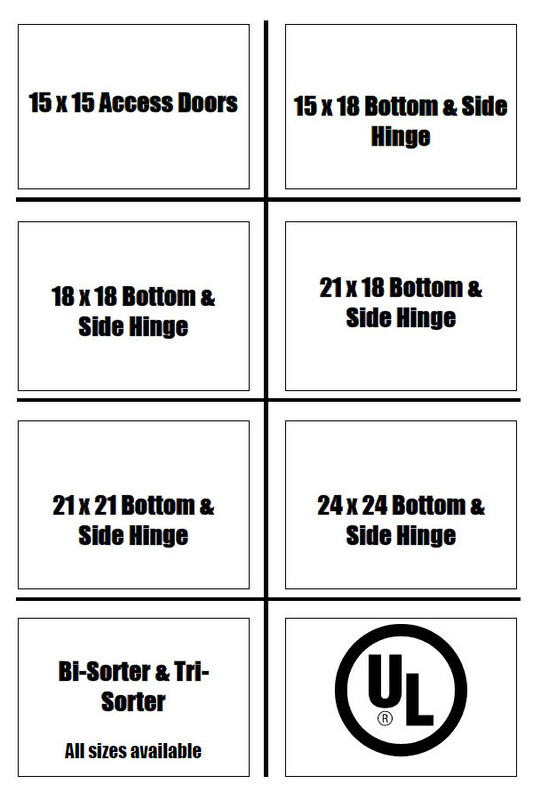 Additional registers may be added as the capabilities of the Easy-Wave® system increase.